Arkanoid, Breakout, Breakfree, and however all these versions and clones are called, they all share one common thing. A paddle and addictive gamemechanics. One of the first versions of the game was released on the Commodore64 in 1987 and was a big hit for publisher Taito/imagine back in 1987. It also appeared on a lot of different systems, even on cellphones today the game is still popular. And it can be really mean and hard, and there are power up, a lot of them. What do you want more? And because you are reading this you might also be interested in the fact that the original breakout (on which Arkanoid is based and which was a 90° clone of Pong with twist (the bricks) itself) was first developed by Atari founder Nolan Bushnell Atari engineer Steve Bristow for Atari in 1976. One of the coolest clones is the pixel breakout version that you can find under the link right here. Just play it some time until you haven enough pixel balls and it gets really cool! 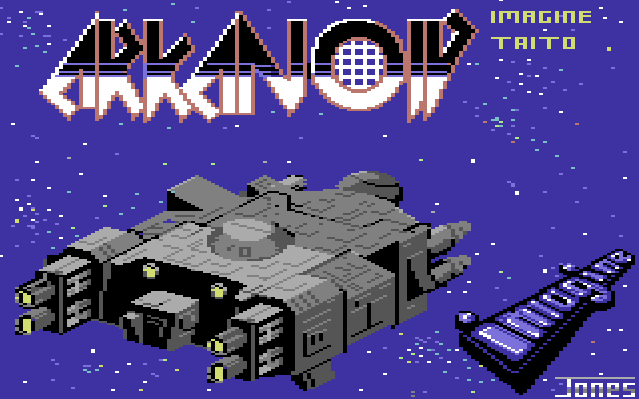 Here you will find all layouts for the blocks in all 33 Levels of Arkanoid on the c64. So you can go down memory lane and get upset once more when you see the ultra mean levels. Or you prepare yourself for the levels by viewing them. Or you just click through here.